My family loves curry dishes very much. This prawn and tomato curry dish tastes divine. Tomato goes so well with curry. Its natural acidity just balances the salty and mildly hot curry. This dish mainly makes use of the spices and fish sauce as a base. Beware that the saltiness of fish sauce is very different from brand to brand. If you’re using a different brand from mine, make sure you taste along the way of your cooking and add bit by bit of it until you’ll get the taste you want. 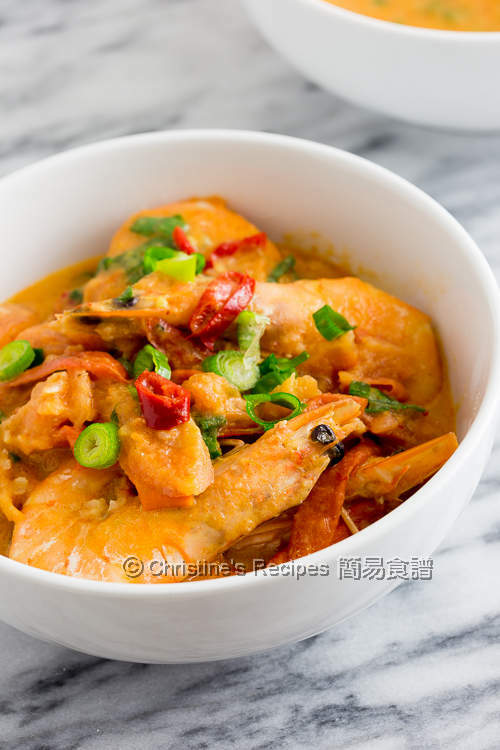 This prawn curry dish can be made on the go, perfectly pair with a bowl of steamed rice. Trim away the sharp tips on the prawn heads. Rinse and pat dry with kitchen towels. Season with salt and pepper. Heat oil in a frying pan over medium high heat. 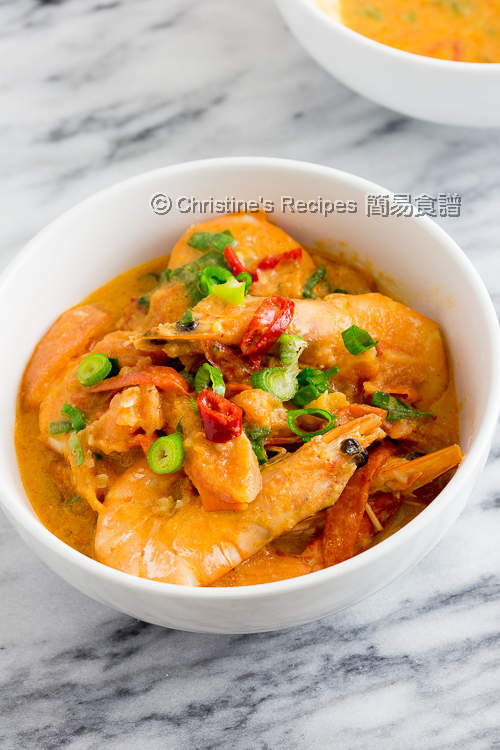 Add the prawns and cook until both sides are lightly golden, but the inside is still raw. Set aside. Add a little more of oil. Saute the shallot, garlic, red chilli and red curry paste until aromatic. Add the tomatoes and stir to combine. Pour in the stock and fish sauce. Cook until the tomatoes start to be softened. Toss back the prawns. Cook until the prawns are almost cooked through. Stir in the coconut milk. Garnish with spring onion. Serve immediately. 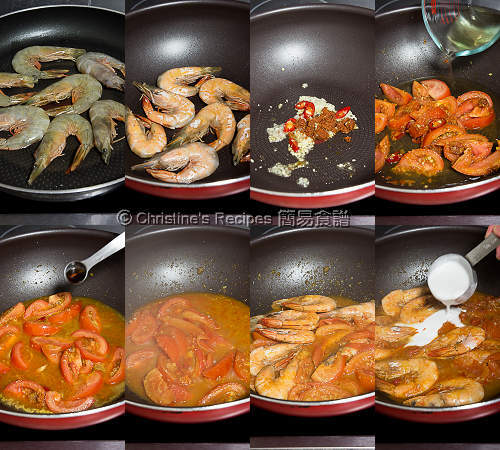 Make sure not to over-cook the prawns as you don’t want them turn rubbery. 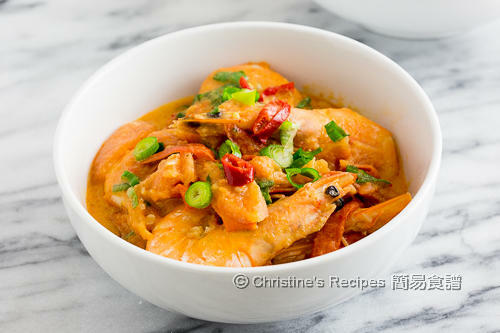 You may shell the prawns before cooking for convenience in eating. Yet, retaining the shells will make the sauce taste better. After adding the coconut milk, you don’t need to cook it too long, just get it heat up with the sauce. I used the Three Crabs brand fish sauce and Mae Play red curry paste. If you use another brand, please adjust the amount accordingly. I too enjoy a good curry! This looks really tempting with the jumbo prawn. Thanks for your sharing. Sure, there isn't any right or wrong ways. You can go for the way you feel confident in. I just take a safe route, easier to control the cooking time of prawns and won't overcook them. My family enjoys digging into the dish like that.